Thank you for visiting our website here at Quotation Check – We have done a ton of research into prices and costs within the construction and home repair industries. Our aim is to provide you with a realistic cost guide so you know roughly how much to pay for repair jobs around your home. If you are a first time visitor to our site, you can see all of our cost guides by visiting our Price List. 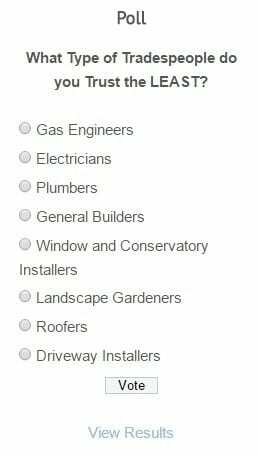 Of course all of that means nothing if you are unfortunate enough to instruct a “rogue trader” to work on your property. My name is Dan and I’m one of several contributors to this website. I also have over 18 years experience in the roofing industry. I wrote this article because there is currently a rogue trader epidemic in the United Kingdom and I wanted to share my advice on how to avoid these dodgy traders. We’ve all been told to get 3 quotes for comparison but how many of us actually do it? Comparing prices is only one side of the coin. By getting 3 written quotes you can compare advice, opinions and specifications, which should all be included in the paperwork. If a tradesperson has been ripping people off or doing sub-standard work then chances are past customers would have made a complaint that can be found online. Google has an 80%+ market share in the UK so do a search on their website for the company name and also the name of the director/company owner. Do a check on Companies House for both the company name and the directors name. Look for any other businesses they have a relationship with and do a Google search for them as well. Research any companies that have ceased trading, try to find out why. Also do a search for CCJs (county court judgements), you can start that here. Web forums are places online where individuals can discuss topics and get free advice. You could ask others if they feel the price is fair, or of the specs are appropriate. Forums are a great place to get advice. My favorite is DIYnot but there are many more. If you have no knowledge of DIY or home repair then bring a friend along to give you support when you have companies and traders visiting your property. Four eyes is better than two and if your friend has experience in the construction industry then that’s a bonus. If you are having an entire house built or an extension then the cost is impossible to predict accurately but for smaller jobs up to £10,000 you should insist on a fixed written quote. Quotes should list all the work to be completed and all the materials used. Written quotes offer much more protection compared to vague estimates. Logos, federations, trustmarks and schemes like Checkatrade/Rated People etc do have some benefits but should be treated with caution. Most of these companies are there to make a profit and only carry out basic checks on their members. While these schemes are good at rooting out the “take your money and run” types of conmen they are not perfect consumer protection schemes. If you trust Rated People or Checkatrade I dare you to send them an email asking them how much compensation they offer to customers who have had shoddy work done by traders they recommend. The answer is of course none at all. They are happy to take hundreds of pounds from traders so they can advertise on their website but they offer zero compensation for jobs that have gone wrong. That is a true reflection of how much Rated People or Checkatrade actually trust the businesses they recommend. 8) Can You Trust a Recommendation From a Friend? The advice received from friends can be invaluable but it can also be a curse. If the work can be inspected easily, perhaps a floor, patio or bathroom/kitchen then the recommendation can be trusted but be wary of recommendations when the work cannot be easy assessed. Roofing work, damp proofing and underground work are all types of work that cannot be checked easily, it could take months or years for a fault to develop so be wary of recommendations here. Always ask yourself; does the person who is recommending this company know anything about this subject? Are that savvy? Do they have the same standards as I? The best way to protect yourself is to sign a contract so both you and your tradesperson know exactly what work is being done and what materials will be included. The paperwork should be specific and not vague. Ideally the contract should not only state what is included in the price but also state explicitly what is excluded. Rogue traders often ask for large sums of money upfront. While it’s commonplace for a customers to pay a deposit upfront this should never exceed 20% and there should be a valid reason for this – perhaps because the tradesperson needs to order bespoke materials such as windows or doors.